Before I go even one step further, I wish to thank you from the bottom of my heart for chiming in on yesterday’s blog survey. I didn’t really know what to expect. But you were kind, considerate, and honest with integrity. I’m anxious to share some feedback and offer up some answers very soon. Now… let’s have some fun! 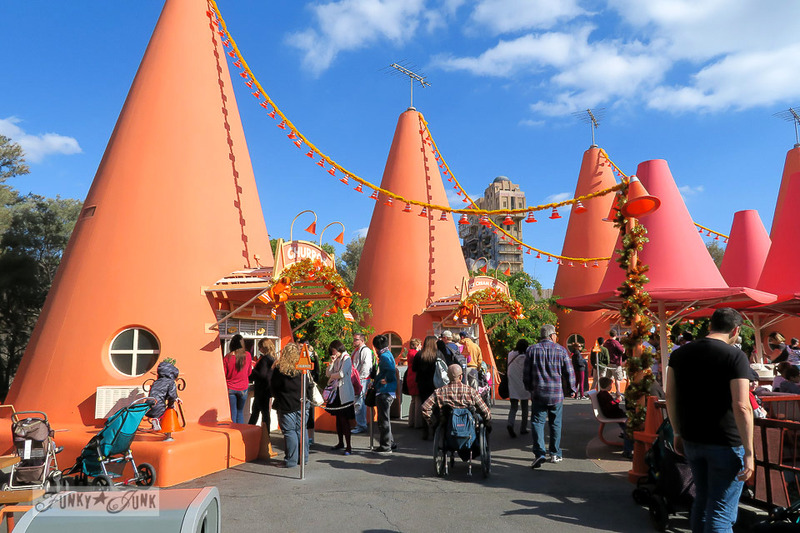 Today is going to be about my fav Disneyland district, and the next post will host my best somewhat hopefully useful Disney tips, along with some pretty incredible themed work. 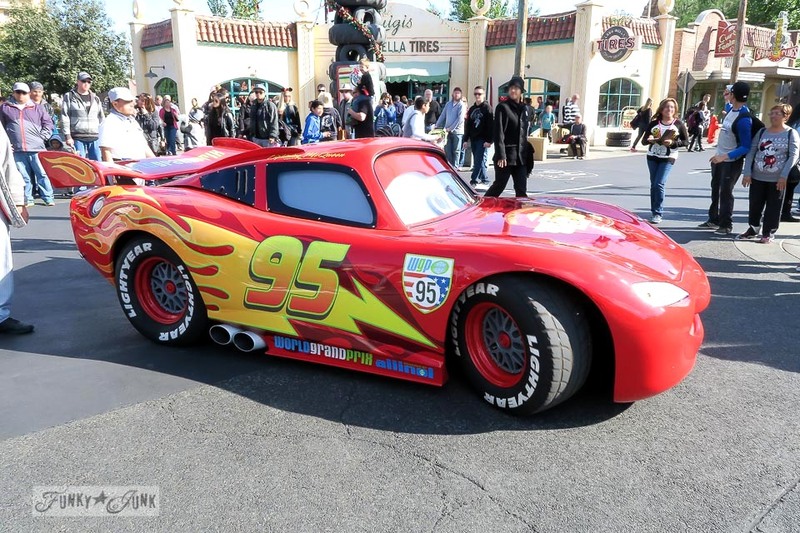 If you haven’t been to Disneyland in a few years, the Cars world will be new to you. This is the first time we saw it, and the moment I stepped out of the cricket filled Bug Land into this little horn honkin’ junky suburb, you know I hit pay dirt! This is the first building I saw. And I’m pretty sure I broke out into a sweat with no heat in sight. I don’t get it. Where was the long lineup to oogle this decadent building?! Well, I’m GLAD everyone was busy chomping down churros and sprinting for fast passes, because that left me all by my lonesome. I went one morning early on my own (my boy needed to sleep), and had the BEST time clicking at every chunka tin I came across. Have you ever been so tired you were walking on numb feet? That was me this day. We were near the end of our trip, and walking all day on pavement is hard work. So my main tip for today? Take some time to forgetallabout the rides, slow down, and take in the restful sights. Because when you’re busy with all those lineups, you truly do miss a great deal of magic in the surroundings. Seriously. Take your time and study every inch of these pictures. And feel free to click them to view them larger. You noticed the filters? Dieing… the theming for Christmas was out of most worlds, and fit like a glove into mine. I can’t even imagine how plain this little town would be without the Christmas decor. I truly felt like this big kid that couldn’t get enough. And then…. I’ve saved the best for last. Ugh…. that’s a GOOD ugh. 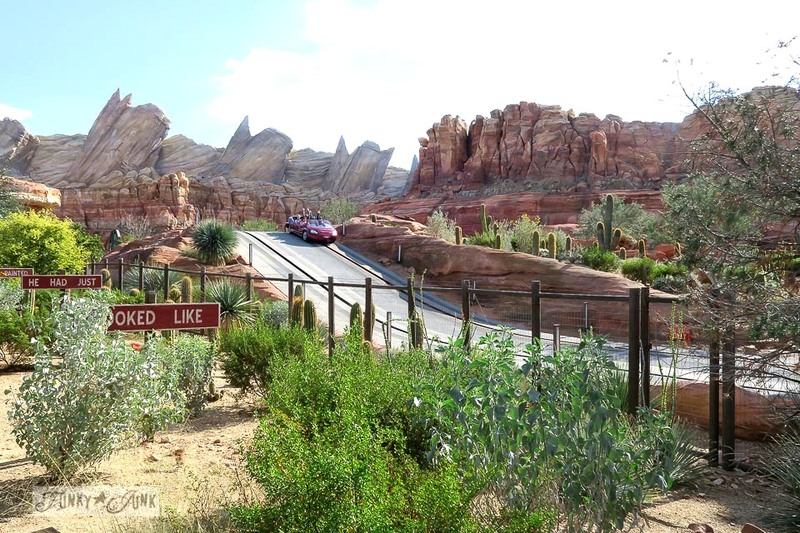 The cars canyon… I can barely mouth the words to how this made me feel. All this incredibleness man made? It was hard to take in. I’ve really come to respect this kind of work, due to my friend Dan’s themed biz, Imagination Corporation. If I didn’t know better, I’d say this was hand carved fibreglass reinforced concrete. How did I do Dan? It was SO BIG. Life size even. I just sat… and stared. And to my utter envy delight, the race cars started whizzing by. 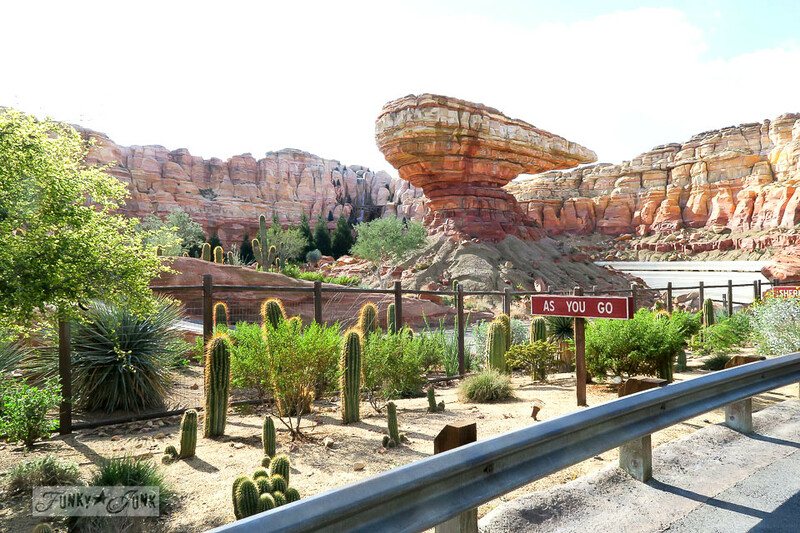 The ride is all about the land of cars. You go through various buildings such as a gas station, workshop, etc etc, all slow and steady like, then suddenly you hit the high road and blast off on a race track! It wasn’t a roller coaster, but close. Flat roller coaster? But THRILLING! So thrilling! The lineups were mayhem for this ride. All day and all night. 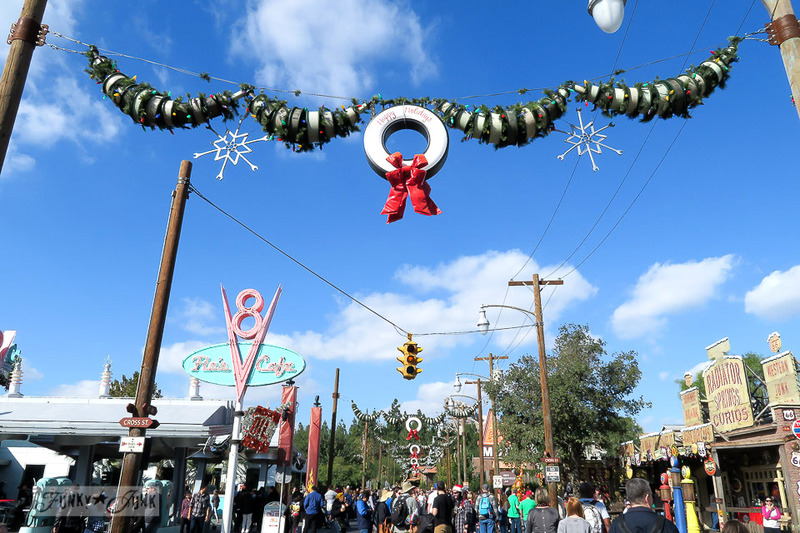 The only way to land a ticket is to go in the AM and stand in line for a fast pass. Which resulted in coming back at 9:30 pm for the actual ride one night. Crazy. But it’s that good. So beautiful by day. But you do know what transpires once the sun goes down in Disney, don’t you? Kaboom! The place is lit on fire, with lights and music and happy people that had cars tickets. Magical! It’s ok. We got on once. Tip #2? DON’T DO THAT. My boy was willing to waste away our last night in a 2 hour lineup for this ride, but not I. He got over it. We ended up going on around 10 other rides instead, with no lineups. I’ll fill you in on how we made out like bandits next post. I think one of the best ideas Disney came up with are the ‘free’ photographers. They stand everywhere. 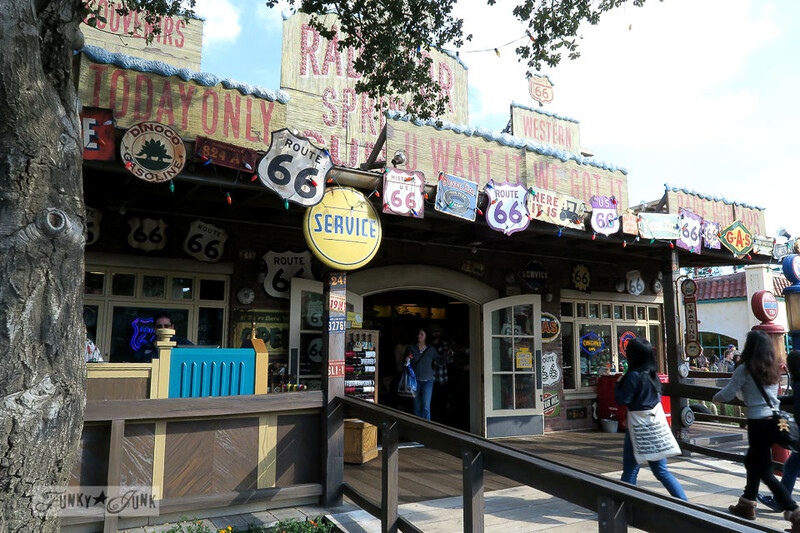 Upon request, they take your picture at certain landmarks, hand you a card, and once you get home, you can view them online and purchase if desired. Thank goodness! Proof we were both there. Twice even. What do you think? 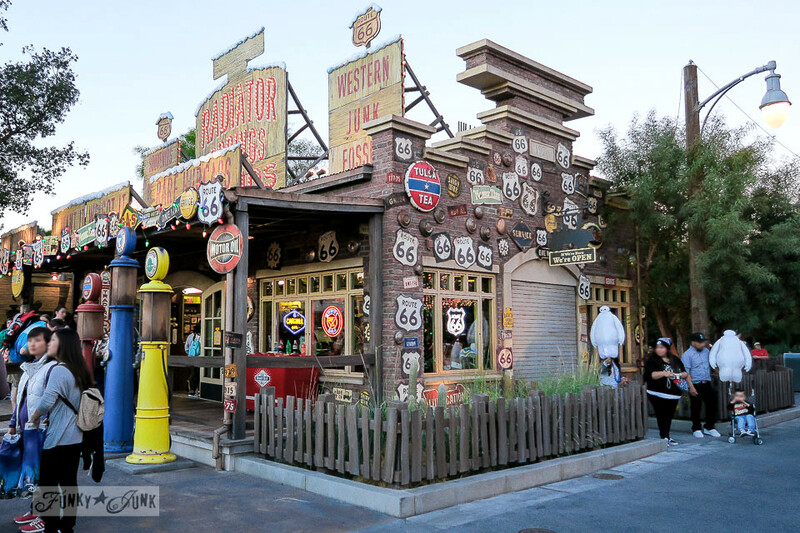 Did the theming blow you away too? What’s your favourite district at Disneyland? Visit all Disney instalments HERE. How fabulous! Right up your alley! Okay, this is fantabulously awesome, and so YOU! 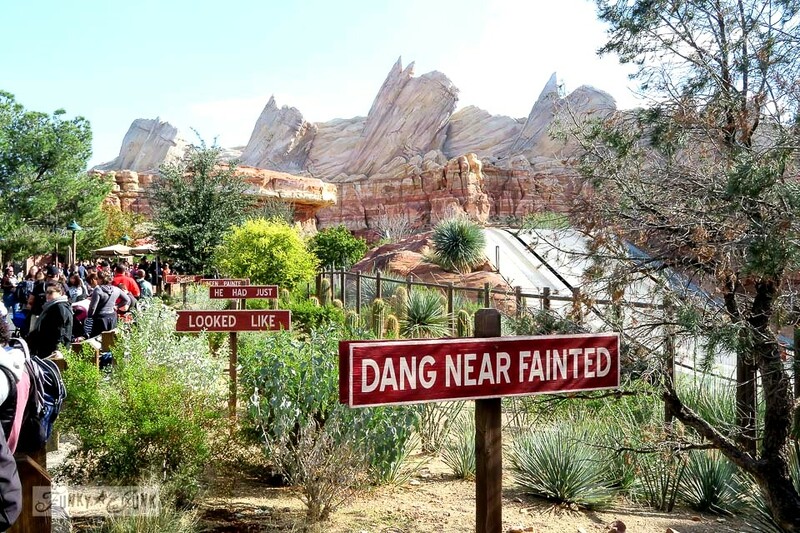 I’m on east coast, so it’s Disney World, and it’s been a few years since we’ve been there, but I can see how I might easily have overlooked this entire theme section. Thanks for sharing! 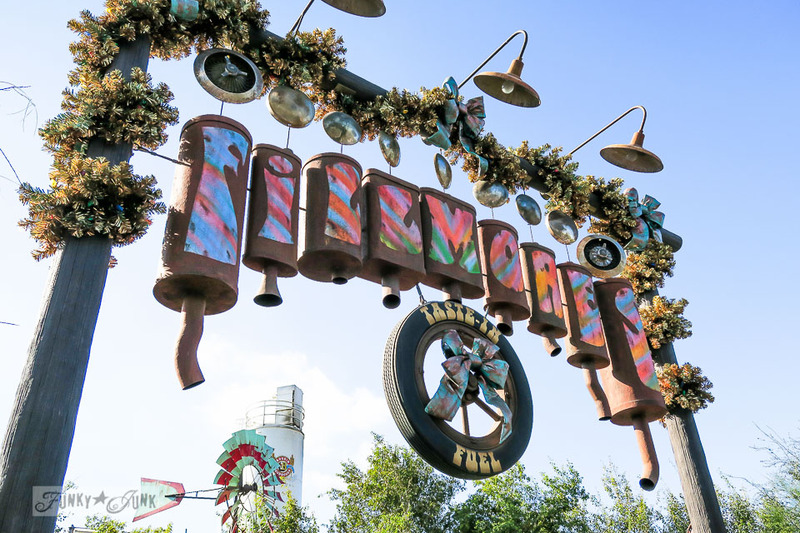 Are you sure you did not have a hand in decorating this theme park? Did they “borrow” some of your ideas? LOL Awesome Donna! Cars world…hands down! Who’s the lucky one decorating all that fabulous junk!?! What a great place. With your son and that, I totally see why you had a blast! I forgot how much I like your vacation posts! You must have been in heaven!!!! And your boy has gotten so big!! Wow! All the way to Disneyland and what do you find?! Anyways, do you know about the feral cats of Disneyland? Walt Disney himself was fine with them taking up residence because they made fine,ahem, mousers. There are feeding stations and they’ve all been fixed and micro chipped. There’s a website about them as well. oh my gosh…. wow! I’ll google it! So interesting! 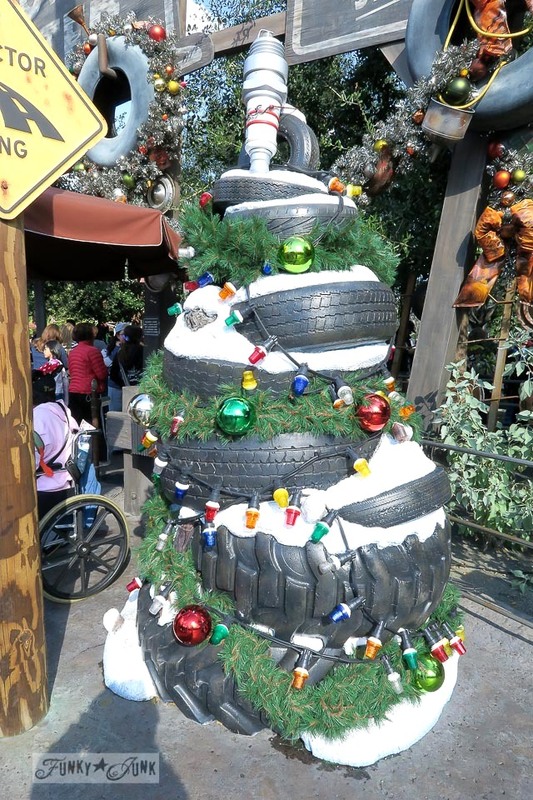 Love the hub cap decorated tree and the air filter garland. It looks like some idea you would send to them! I’m glad you two had fun! This was AWESOME! I’m so happy y’all had a great time! Now for the decor/ambience. Spectacular!!! It looks amazing, and to just be there had to be unbelievable for you. Just heavenly. Have to put this one on my bucket list!!! That was so you! 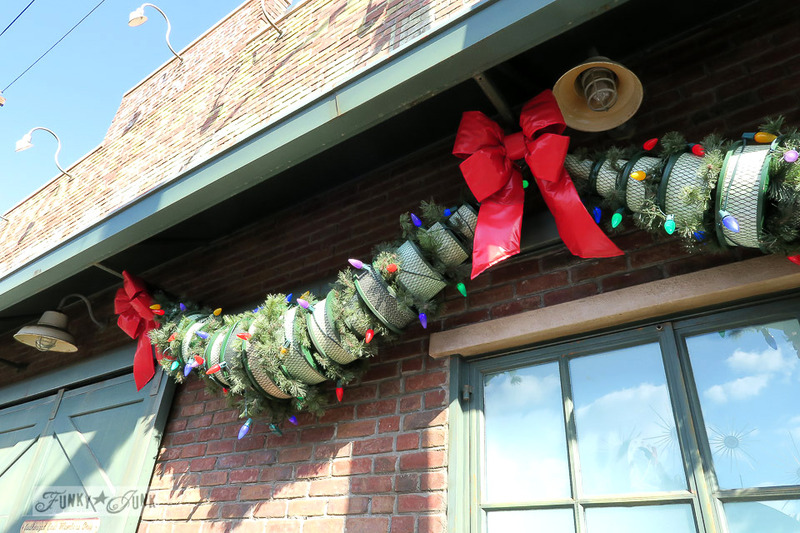 I can just see the air filter garland at your house next Christmas! 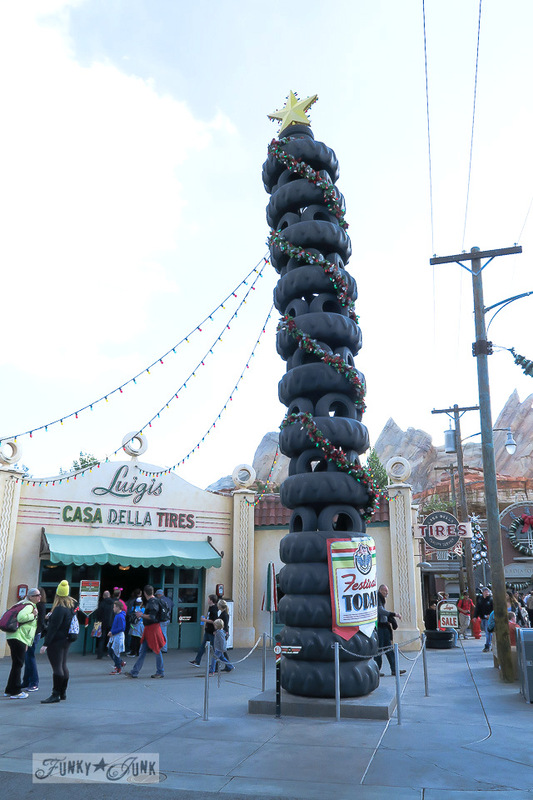 I wouldn’t be surprised of you did a tire tree! haha! Glad you had a great time. The most important part of this trip was time with your son! Ya just can’t beat that! 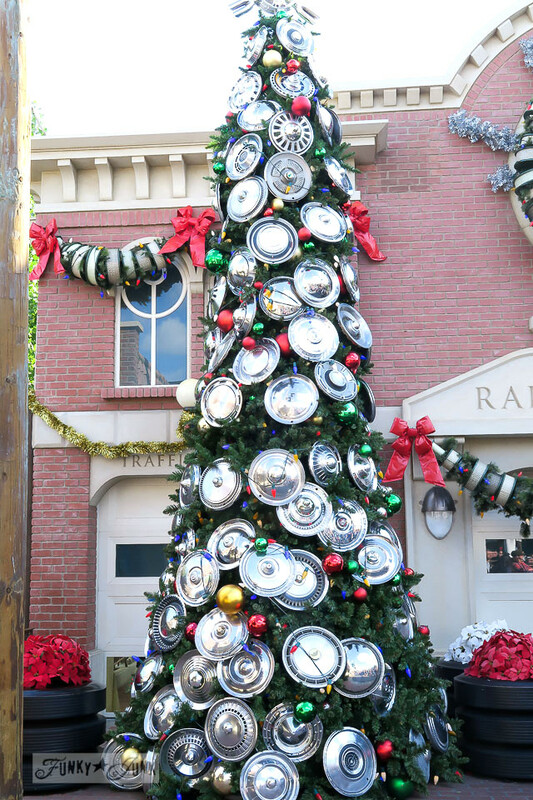 Although the hubcap tree probably came close! Haven’t been to Disneyland in 40+ years, but I do remember I loved the Pirates of the Carribean ride. I haven’t been to Disney in 30 years. 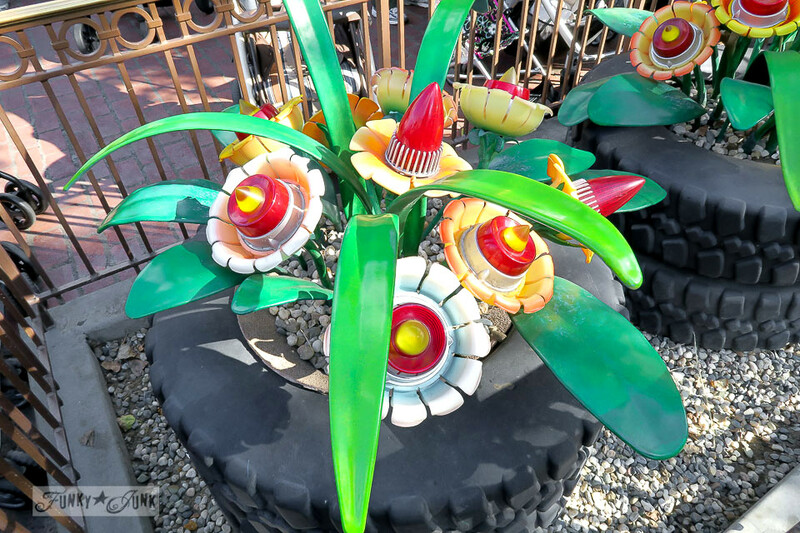 They have gone junking…cool! It’s like they saw you coming! 🙂 It’s been all too many years since I’ve been to Disneyland, but now I want to go just to check this out for myself! 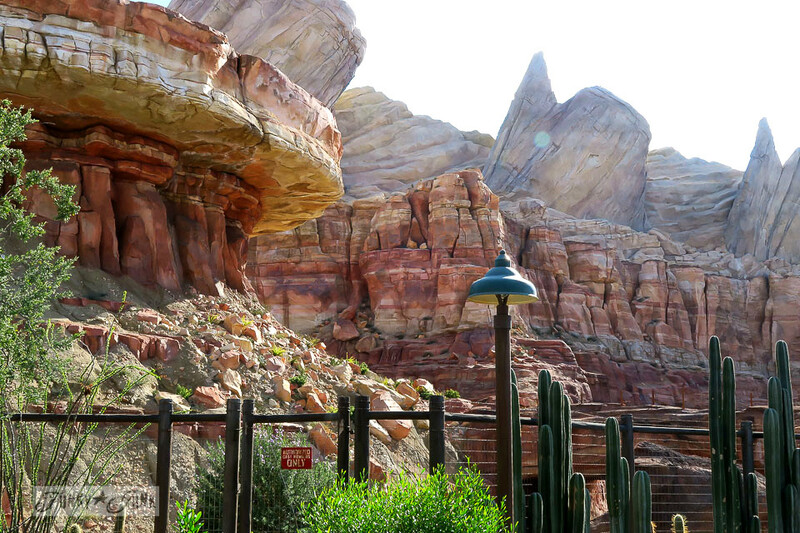 That air filter garland is just off-the-hook…as is the canyon…OMG…just breathtaking! 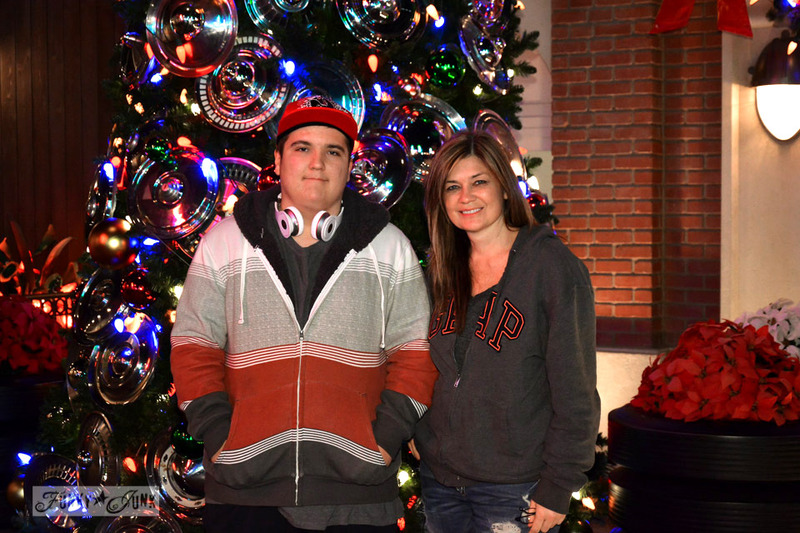 I’m sooooo glad you and your son got to experience Disneyland finally, Donna and those pics of you both are definitely keepers! OMGosh I love it. We were there about three years ago but this was not. My grandsons love “Cars” and I do as well. can’t wait to go again and will not be missing this area. thanks for pictures. Donna – I am so glad you found your happy place! 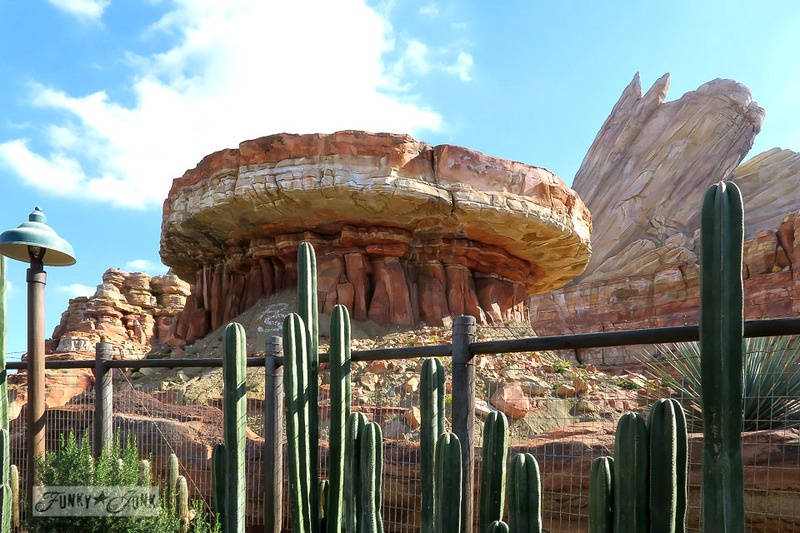 I kinda didn’t say anything about Carsland because I hoped it would be a hands down favorite. Is n’t it wonderful what you find when you are going crazy from one spot to another. I can never get enough of how fabulous Disney is in all the details!! I told you I was wishing I could get down there sooner rather than later – and I have pulled it off. I head down on January 15!! Thanks for sharing. I bet you had a blast with all the nuts, bolts, hub caps, etc., etc. 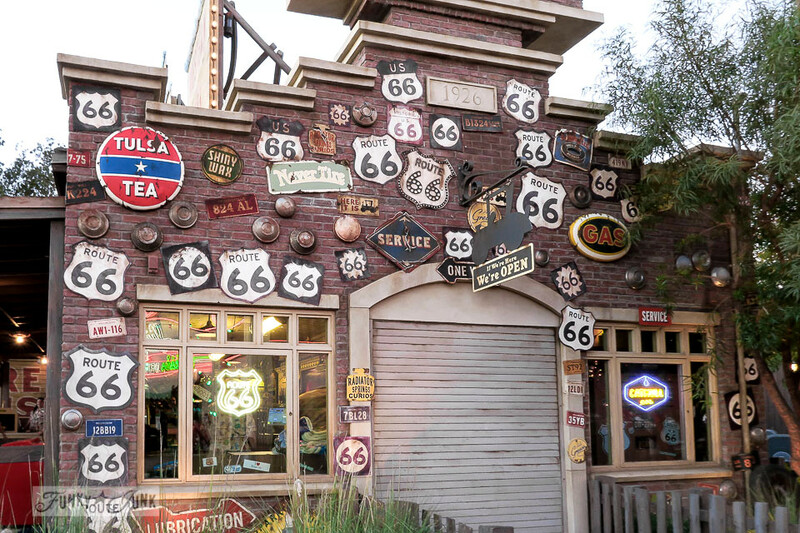 This town on Route 66 is right in my back yard and I know all about how the freeway bypassed it. Sadly, no big time car racer moved in. But, it still survives today. It has been years since I’ve been to Disneyland and probably won’t make it again in this lifetime, it was awesome that you shared with us. Thank you. I’m blown away!!! All those ideas in every single picture are amazing. Some I would have never thought of. Thanks a million for sharing them Donna! They really revved my engine and got some ideas flowing! 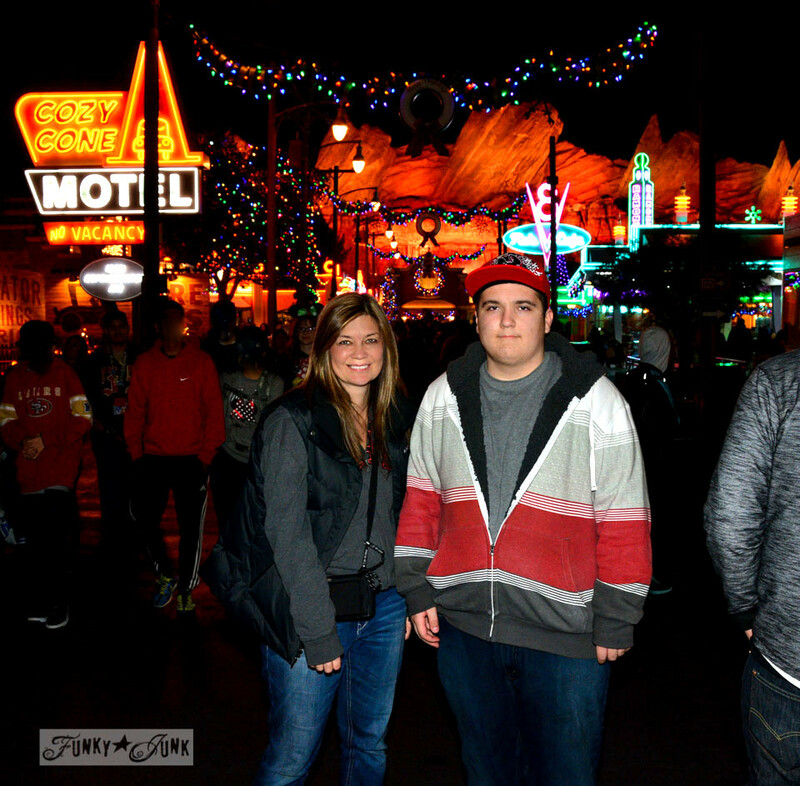 We were at Disney California this past May and loved Carsland. My grandson loves Lightning McQueen so we had to go on the ride as well. It was like we stepped into the movie itself! Being a junker myself, I enjoyed all the junk they used so creatively! Love the hubcab Christmas tree. 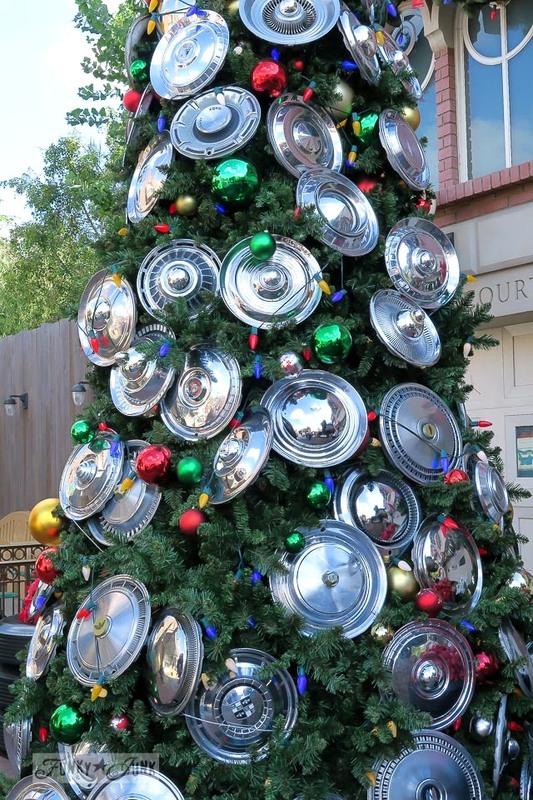 I can just hear Jeff Foxworthy – If you decorate your Christmas tree with hubcaps, you’re a redneck! I loved this post. You let me see the things I would love. 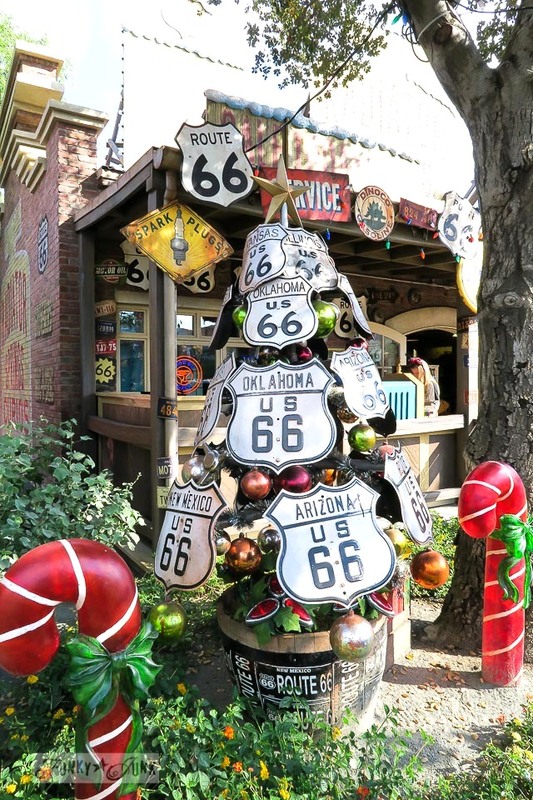 The orange road cones as souvenir hits cracked me up, and that Route 66 sign Christmas tree…. well I’m glad your feet braved the pavement one more time. Now I want to go, it’s been a while.